Please. Please appreciate the sheer nightmare that is seeing Stephen Amell’s face photoshopped onto what is very clearly not Stephen Amell’s body. 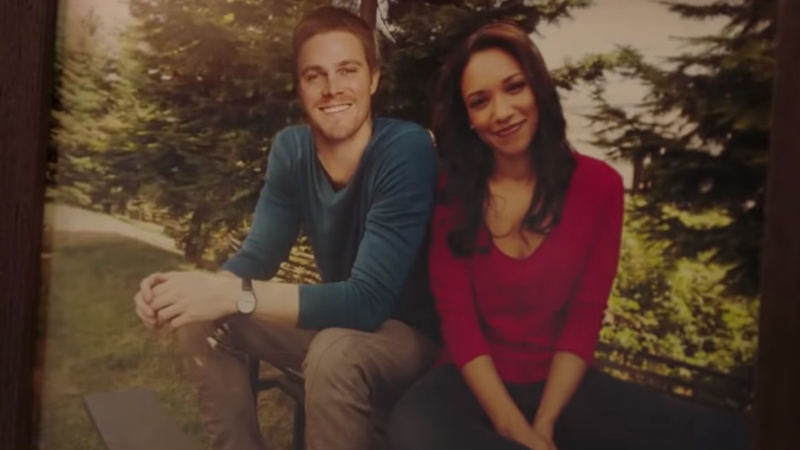 The first teaser trailer for Elseworlds, the upcoming three-way crossover between Arrow, Supergirl, and Flash, has hit the web, and, well, it doesn’t really have what you might be expecting. No Lois Lane. No Black Suit Superman. Not a Batwoman in sight. But it does have Oliver Queen being Freaky Friday’d—an accurate, technical literary term for the conceit of body swapping—into the body of Barry Allen, and being appropriately concerned by it all. Whether this is a true Freaky Friday—in that Oliver is in our Barry’s body, getting his startled smooch on with the same Iris who’s wedding he attended-slash-defended-slash-eventually-rode-the-coattails-of—or if this is our Oliver being flung into the body of an alternate universe where Barry Allen just so happens to look like Stephen Amell instead of Grant Gustin, we’re not sure. But either way, something is up, and that’s before they even start dressing up as each other’s superhero personas. We won’t have to wait long to learn more—Elseworlds begins with an episode of The Flash on December 9.